The Guild was formed in 1977 by a group interested in weaving, spinning and dyeing, eager to share information and ideas and to promote and encourage these crafts. We’re always happy to find new members, you don’t need to have spun or woven before! Generally, the first Wednesday meeting is an informal Spin, Weave & Chat evening, and on the third Wednesday we often have a talk by a guest speaker. There are exceptions to this, so please check our programme for further details – occasionally Saturday meetings and workshops are scheduled in place of Wednesday evening meetings. Generally the 1st and 3rd Wednesdays each month 7:30pm - 10pm. There are exceptions to this, and occasional Saturday meetings and workshops are scheduled. 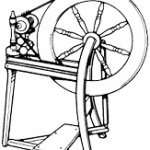 21 November 2018 Speaker: John Miners, "Textiles in East Anglia"
16 February 2019 Saturday Workshop, 10am to 4pm. 23 March 2019 Saturday Workshop, 10am to 4pm. 15 May 2019 Speaker evening, 7:30 to 10 pm. 19 June 2019 Speaker evening, 7:30 to 10 pm. 17 July 2019 Summer Gathering and Sheep Trophy, 7:30 to 10 pm.